I am no budget guru. Really all I do is read reports, view presentations and ask questions. No great mystery. But transportation funding tends to make folks want to run for the hills. I mean, the brave and stalwart Damien Newton at the prospect of making sense of Metro’s budget plaintively asked in re Metro’s fiscal year 2013-14 proposed budget “Dana, you’re going to look through the budget for me, right? RIGHT?”. OK, I’ll take a shot at it Mr. Newton, just as I did last year. A Metro news release on the new budget notes Metro CEO Art Leahy has asked the Board to begin considering options for fare restructuring in future years. 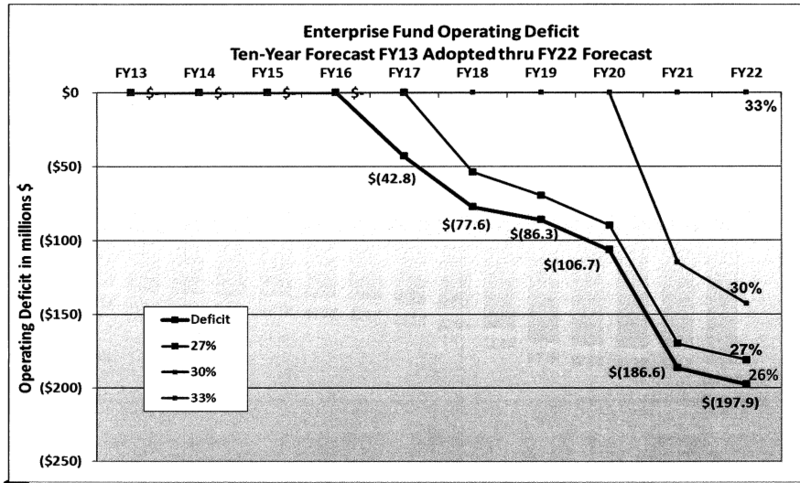 To understand why examine the graph titled Ten-Year Forecast — Operating Deficit (above). This shows that what happens to the projected deficit starting in fiscal year 2016 if the current 26% farebox recovery ratiois maintained. Basically the deficit in the following years balloons alarmingly. Frank Shapiro, Metro’s Deputy Executive Officer for Finance, made an informative presentation at the May 22, 2013 meeting of the Metro Citizen’s Advisory Council including details about added service to the Orange Line and various rail lines. Regarding the the cost of the day pass and senior, disabled, Medicare and student passes Shapiro informs me the budget assumes those will not change. One other issue that is somewhat vexing involves the deferred maintenance program. Shapiro when questioned by the Council members noted Metro has budget for rail deferred maintenance but did not assign sufficient staffing at that time to fully implement it because the program was not clearly defined. Metro has maintained an extensive bus deferred maintenance program for a number of years. Another cause of delay is for years the agency has been undecided whether to rehabilitate aging rail vehicles or order new ones. My understanding is the original Blue Line cars are to be retired in a few years while the Red Line cars will get what is known in the transit industry as a mid-life rebuild. My thanks to Mr. Shapiro for some very helpful clarifications. The link to the presentation appears to be broken. Why would farebox recovery ratio be held fixed in the calculation? I would assume the natural thing to do would be to hold fixed is fares, growth rate of ridership, and various costs, and then see what farebox recovery ratio is implied by that. Regarding $7 gas, I’d be the last person to complain if high gas prices keep encouraging people to switch to transit, but go back to 2006 and people were saying the same thing about $4-5 gas. Transit agency finances have not improved appreciably since then. Part of that is due to reduced support from other funding sources due to the recession, but another part is that increases in energy costs hurt transit agencies too. There is also the separate question of why we are projected to have an operating deficit. Increasing costs of inputs? More service? Spiraling pension and health care costs? As Jarrett Walker often points out, making money is usually not the only goal, or even the primary goal, of an agency. I don’t really care what the farebox recovery ratio is if the service is doing what we want it to do and there is a source of funding. If FRR is low because of poor enforcement, that’s different. You could drive up FRR and reduce the operating deficit by slashing low-volume routes and off-peak service, but why would we want to do that? On a couple technical notes… it would appear that chart only makes mathematical sense if you assume that operating surpluses from early years are rolled over to later years. Regarding the comparison of FRR, I am curious where they got their data. A quick look through the NTD shows that FRR in the 20s is not uncommon for bus-dominated systems. BART achieves 64% but SF Muni is only 29%. It’s true that by any measure, riding transit in LA is cheap. Upon completion of the Regional Connector/Gold Line/Expo Lines, you’ll be able to go 40 miles for $1.50. It’s hard to imagine any way such a service could be run profitably. But when you consider the demographics of ridership, it’s not a bad thing that riding transit in LA is cheap, and we should probably find ways to fund it other than raising fares. Editorial: Why Raise Fares When Metro’s Building Even More Free Parking?